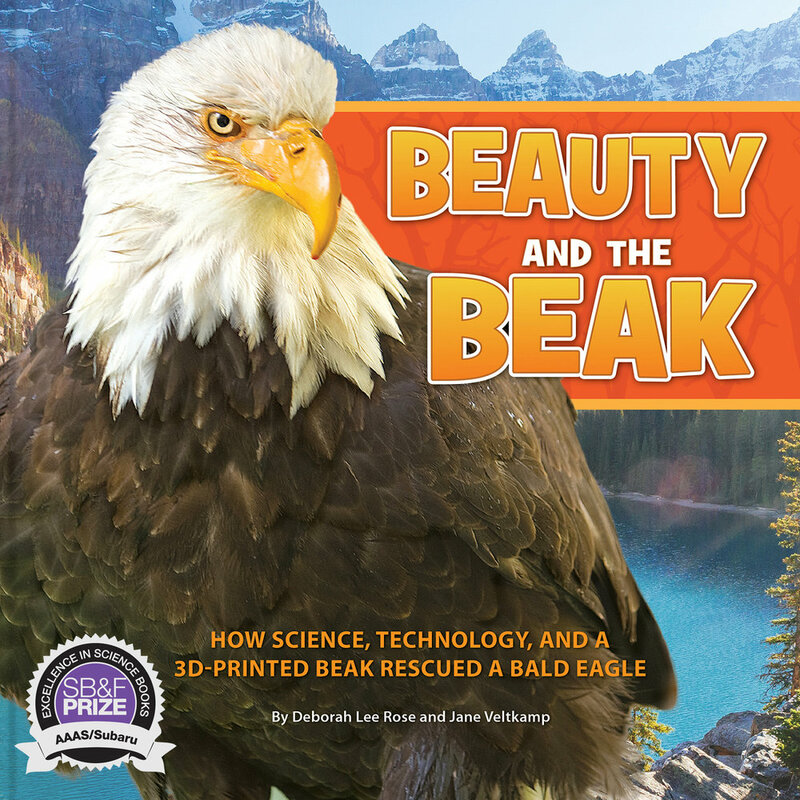 Beauty and the Beak: How Science, Technology, and a 3D-Printed Beak Rescued a Bald Eagle, by Deborah Lee Rose and Jane Veltkamp. Persnickety Press, 2017. Beauty is a wild bald eagle who made world news when her beak was shot off, leaving her helpless. This brave and heart-lifting story tells how she was rescued and how scientists engineered a 3D-printed prosthetic beak that enabled her to eat and drink on her own. The book includes expanded information about bald eagles as a top predator species, their near extinction in most of the U.S., their successful reintroduction back into the wild, and efforts to conserve this critical raptor species today. The story highlights the plight of animals in need as well as humans, from young children to military veterans, who are given new lives with ingenious, state-of-the-art prosthetics. Deborah Lee Rose is an internationally published, award-winning author of bestselling children’s books. Deborah directed communications for Howtosmile.org, the NSF/Oracle-funded online collection of more than 3,500 STEM activities for those of all ages. The collection was named the best website for teaching and learning by the American Association of School Librarians and the great website for kids by ALA’s Association for Library Service to Children. She helped create groundbreaking STEM apps with more than a quarter million downloads, including DIY Sun Science and DIY Lake Science, as a science writer for University of California, Berkeley’s renowned Lawrence Hall of Science. Jane Veltkamp received training at the prestigious University of Minnesota Raptor Center where she learned how to expertly care for and treat medically injured birds of prey. She received her master’s degree in biology from Purdue University, where her thesis investigated wintering bald eagle habitat in Indiana. She began her work by reintroducing peregrine falcons in the Midwest and more recently ospreys and peregrines in South Dakota. Since then, she has treated two thousand injured birds of prey and lectures extensively about the ecology of birds of prey, traveling with specially trained eagles, hawks, owls, and falcons. She works closely with the Idaho Department of Fish and Game and is permitted for her work through the U.S. Fish and Wildlife Service. Janie is also a master falconer and has a bachelor's degree in nursing.